Physical limnology in Lake Baikal was pioneered by Vereschagin (1927, 1936, 1937), who was first to establish that dependence of the temperature of maximum density (Tmd) on pressure is of great importance for the pattern of water temperature (T) vertical distribution. The water column of Baikal may be principally divided into two zones, based on temperature profiles and water exchange processes: an upper zone, down to 250 m depth, beneath which lies a lower zone, from 250 m down to the bottom sediments (Shimaraev, 1977; Shimaraev and Granin 1991; Weiss et al, 1991). 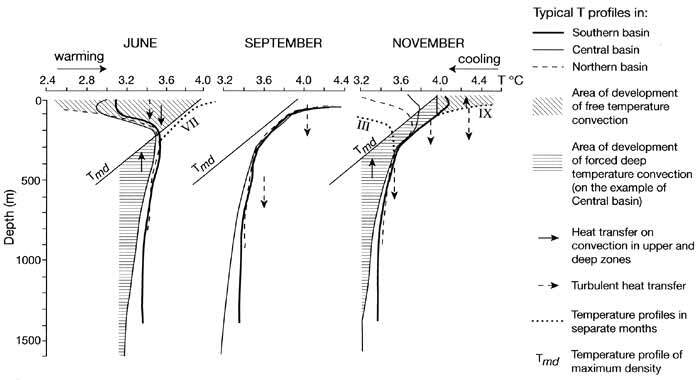 Within the upper zone, Т passes through the state of Tmd twice a year, accompanied by: (1) changes in temperature stratification (from inverted to direct in spring and vice versa in late autumn); (2) changes in the coefficient of thermal expansion; and (3) the development of free temperature convection. During these transitions, temperature convection, wave action by strong winds and under-water currents ensure temperature homogeneity of water within the active layer, and low stratification stability (otherwise known as the state of homothermy). When summer and autumn stratification occurs, the epilimnion and the thermo-cline are formed within the surface-water layer up to 25-50 m depth, reaching annual maximum stability in August-September. During winter, stratification becomes inverted, the thermocline within 25-100 m layer is eroded resulting in a weaker stratification than in summer (Granin, 1991). In early summer, when spring convection diminishes, the vertical Т profile in a 50-200 m water layer is close to the Tmd profile; temperature decreases with depth due to increasing pressure (c. 0.21°C every 100 m) (Shimaraev and Granin, 1991). The lower boundary of the active layer (~220 m) coincides with the occurrence of mesothermal temperature maximum (MTM) in winter, when Т is equal to Tmd (c. 3.5°C). Its position is determined by the intensity of pre-winter (November-December) water mixing and cooling within the active layer. In turn, the depth of the MTM serves as a boundary for the development of spring convection (Vereschagin, 1936; Weiss et al, 1991; Shimaraev and Granin, 1991). Within the deep-water zone, Т is greater than Tmd at all depths (Figure 17.3), conditions that are typic for warm monomictic lakes (Vereschagin, 1936) and oceans (Mamaev, 1987). Vertical Т gradients are small (from 4-5 x l0-4 °C m-1 in 300-500 m layer to 0.7-1.4 x 10 4 °C m-1 deeper than 1000 m) resulting in low stratification stability, characterized by the Vaisala frequency close to the inertial frequency. Waters in the central basin are more stratified and cooler than waters in the southern and the northern basins (Shimaraev, 1977). For example, typical near-bottom temperatures within each of the deepest depths of each of the three basins are about 3.30-3.35°C in the southern, 3.10-3.15°C in the central, and 3.40-3.45°C in the northern basins. Deep-water convection may be generated by forced sinking of colder, surface waters to 200-220 m depths, which in turn are initiated by local and episodic atmospheric influences (Weiss et al., 1991) or by water circulation on the front of spring thermobars (Shimaraev et al., 1993). Total dissolved solids (TDS) are low in open Baikal waters (about 96 mg I-1; Votintsev, 1993) and vertical differences do not exceed 1.5 per cent of TDS. Nevertheless, when Т is close to 1mi and the coefficient of thermal expansion is near zero, the differences in TDS may lead to water sinking within the MTM zone. This in turn causes thermobaric instability, and results in deep-water convection. Cold water intrusion towards the bottom of this zone is often accompanied by increases in ionic salinity (Hohmann etal., 1997), thus testifying to thermohaline origin of deep-water convection. Spatial differences in TDS may also contribute to ventilation and deep-water formation (Peeters et al., 1997; Hohmann et al, 1997). For example, during the cold season, the Selenga River waters containing up to 150 mg 1-1 of dissolved solids, sink along the Kukui canyon towards the deepest depths in the central basin (Hohmann et al., 1997). On the other hand, water in the northern basin is about 0.7 mg I-1 less mineralized compared to that in the central basin, and this results in isopycnic water sinking from the central basin along the Academician Ridge into the deep-water zone of the northern basin. Deep waters are cooled in spring and early summer by convection, and are warmed in autumn by heat transfer from the upper zone, resulting in seasonal temperature changes in the order of 0.03-0.05°C. Turbulent heat flux into the deep zone is greatest in November because of maximum wind activity at this time (Verbolov et al., 1965). Vertical transfer of water within the field of horizontal currents may also be caused by deep-water renewal. Sinking of surface waters occur in the coastal zone and also at the interfaces of secondary circulation, whereas an ascent of deep waters takes place in the centre of the lake (Verbolov and Shimaraev, 1973). Strengthening of general circulation results in intensification of the near-bottom currents. In summer and winter the mean velocity of currents between 20 m and 50 m is in the order of cm s-1, whereas within the layer 50-100 m above the bottom, the velocity may reach 4-8 cm s-1. Within the major part of the water column (between 200-300 m and the near-bottom layer), the velocity is less than 2 cm s-1. During spring (May) and late autumn (October-November) maximum currents at the near-bottom layer may be close to those observed in the surface waters, up to 10-20 cm s-1 or more (Sokolnikov, 1960, 1964; Verbolov, 1996). As a result of such circulation, the water above under-water slopes is significantly warmed in summer and autumn. Therefore, the transition from direct to inverted temperature stratification in the deep-water coastal regions advances later, in comparison to the centre of the lake (Shimaraev et al, 1994). Deep-water renewal may also be caused by processes which occur at thermal bars (Shimaraev et al., 1993). Thermal bars arise in May, where warm riverine waters (T > 4°C) of large tributaries (e.g., the Selenga, Upper Angara, and Barguzin) come into contact with colder lake water (T < 4°C). At these contact zones, denser (T = Tmd) waters sink downwards, carrying away waters from both sides of the front (Figure 17.4). Sinking of cold water (T = 3.1-3.4°C) initiates deep-water temperature convection resulting in the near-front disturbance of winter stratification and complete homothermy at depths greater than 150-200 m. Below the front, cold water moves downward along the slopes. If the coastal water is more mineralized than open waters, sinking of these warmer and denser waters occurs simultaneously. Both types of convection result in large-scale circulation processes, with rapid (0.2-0.3 cm s-1) water sinking along the underwater slopes, compensating for the ascent of deep waters directed towards the front of the thermobar (Shimaraev et al., 1995). Deep-water renewal activity increases in the coastal regions, resulting in oxygenation of deep waters (Shimaraev et al., 1996), the input of plankton and suspended particles (Likhoshway et al., 1996), as well as an increase in the number of microorganisms (Parfenova et al., 2000). This in turn stimulates active internal cycling of organic matter in coastal regions of Baikal compared to the open lake. Estimated mean rates of vertical water exchange are based on determination of the water age at different depths using dissolved atmospheric chlorofluorocarbons (CFCs) and 3H-3He (Weiss et al, 1991; Peeters et al., 1997; Hohmann et al., 1998). Results obtained show that in different parts of the lake the age of waters deeper than 250 m ranges from 7.2 up to 11.1 years, corresponding to 9-13.8 per cent deep-water renewal. In 1992-95 the mean rate of vertical water exchange through 250 m depth was 77.0 m a-1 in the southern, 75.4 m a-1 in the central, and 59 m a-l in the northern basins, respectively (Hohmann et al., 1998). The water budget is especially notable for the predomination of river influx (83 per cent) over atmospheric precipitation (17 per cent) and the dominance of drainage from the lake (81 per cent) over evaporation (19 per cent) (Shimaraev et al, 1994). Relatively few tributaries contribute to the bulk of the input into Baikal, with the three largest (the Selenga, Upper Angara, and Barguzin) contributing 47 per cent, 13 per cent, and 6 per cent of the total annual river inflow, respectively. Only a further 12-15 other tributaries are taken into account as 'gauged' rivers when estimating the total chemical budget of the lake (Granina, 1997). Taking into account just the riverine input (since the atmospheric input is close to evaporation), one can calculate from the data published by Afanasyev (1976) and Gronskaya and litova (1991) that the entire water volume of Lake Baikal is replaced every 377-400 years. This is termed the 'water residence time'. About 98 per cent of TDS (in excess of 6 kilotonnes) enters the lake via rivers of which approximately 14 per cent accumulates annually (Votintsev, 1961). Published data on the chemistry budgets for the lake are discussed by Granina (1997). Until recently, particulates have not been included in existing budget estimates, even though they comprise up to 30 per cent of the total input of chemicals into the lake. Since 1993, however, data on the composition of suspended particles in rivers have been obtained, enabling for the first time complete budgets (both dissolved and particulate) to be constructed for some elements (Callender and Granina, 1995, 1997a, b). These budgets are crucial in determining different external and interlacustrine processes. For example, biogeochemical silica mass balance (Figure 17.5) shows that the production of diatoms (siliceous microalgae) in the lake is supported mostly by remineralization processes in the water column but is accompanied by a significant contribution from riverine inputs of dissolved silica. Fig. 17.5 Box diagram of silica mass balance and internal cycling in Lake Baikal. Fluxes are expressed as million tonnes of silica per annum and water column inventory as million tonnes of silica. Comprehensive water chemistry datasets were collated in the 1960s by Votintsev (1961) and Votintsev et al. (1965), and have since been updated by Falkner et al. (1991) (Table 17.2). The pH of the lake water is generally 7.1-7.2, although photosynthetic activity may result in a larger range (7.1-8.6) (Votintsev, 1961; Falkner et al., 1991). The total mineral content of the lake water is relatively low (94-96 mg I-1), reflecting the chemistry of the tributaries, which is controlled predominantly by the weathering of igneous crystalline rocks (typical in the lake drainage basin). Generally, the major ion composition is dominated by Ca2+ and HCO3; most of the tributaries have similar major ionic compositions (Votintsev, 1961). 1. Major ions and some minor elements, whose distribution is characterized by a uniform pattern of vertical distribution and by an absence of seasonal changes (except within the regions under tributary influence). 3. 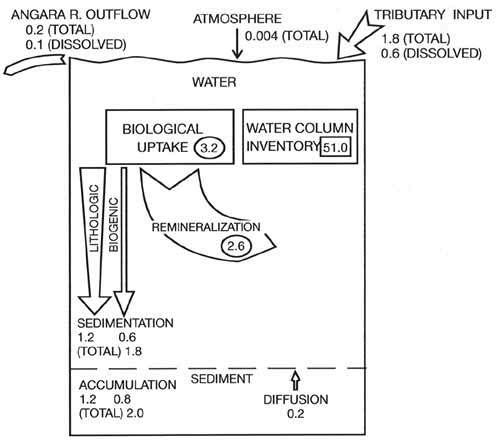 The constituents whose concentrations decrease with water depth: oxygen (02), organic matter (OM), and barium (Ba). Residence times for many of the major ions (Ca2+, and SO24) are similar to the estimated residence time for water (Falkner et al., 1997), indicating that these ions are in steady state with respect to their riverine inputs. This refutes claims by other authors that ions, such as sulphate, are increasing due to anthropogenic activity (e.g., Tarasova and Mescheryakova, 1992). Concentrations of all the other non-major ions are controlled by biological and hydrological processes in the water column. For example, nitrate and phosphate concentrations show seasonal changes in the trophogenic layer, with minima occurring every spring and summer due to increasing phytoplankton numbers (Votintsev, 1961; Tarasova and Mescheryakova, 1992). These seasonal changes tend to deplete nutrients up to 100 m depth, during which time nitrate may limit productivity as it becomes severely depleted (Kozhov, 1963; Weiss et al., 1991), while phosphate levels rarely fall to limiting levels (Weiss et al., 1991; Tarasova and Mescheryakova, 1992). Concentrations of silicon are 3.5 times lower than that in riverine waters because of intensive silicon uptake by diatoms that predominate in the plankton community (Votintsev, 1961). Vertical profiles of silicon show surface-water depletion and deep-water enrichment due to silicon uptake by diatoms in surface waters and its release by dissolution of valves sinking into deeper waters (Votintsev, 1961; Votintsev et al., 1965; Falkner et al., 1997). Silicon enrichment of deep waters is also caused directly by riverine input, especially in the central basin (Domysheva et al., 1998). The depth-weighted average of silicon concentration in each of the three basins is 0.85 mg H (south), 1.06 mg I-1 (central), and 0.95 mg I-1 (north) (Domysheva et al., 1998). Consistent with the known accumulation of biogenic silica in Baikal sediments, the residence time of silicon is c. 170 yr, significantly less than the water residence time of the lake (Falkner et al., 1997). Oxygen concentrations in the upper water layers range from 94 per cent to 104 per cent saturation, whereas saturation of near-bottom waters is usually less than 80 per cent (Votintsev, 1961; Weiss et al. 1991; Shimaraev et al., 1996). The high oxygen saturation of surface waters reflects the combined effects of atmospheric exchange, photosynthetic production in the photic zone, and respirative consumption (Weiss et al., 1991). Oxygen consumption within the deep-water zones of the central and northern basins ranges from 1.1 to 3.4 umol I-1a-1 (Shimaraev et al., 1996). An attempt to estimate the atmospheric oxygen exchange exhibits substantial spatial differences across the lake; the average oxygen uptake is much higher during the long period of autumn-winter cooling compared to spring warming (Mizandrontsev et al, 1996, 1998). Trace elements have been poorly investigated in Lake Baikal because of their extremely low concentrations, which approach general detection limits; this is changing with better practice and state-of-the-art techniques (e.g., Falkner et al, 1991, 1997; Grosheva et al., 1993). The vertical distribution of trace elements in Lake Baikal is rather uniform (Vetrov and Kuznetsova, 1997), although there are some notable exceptions. For example, the vertical profile of iron shows a sharp gradient within the photic zone, possibly caused by photosynthetic activity (Leibovich-Granina, 1985); the same may be a case for vanadium, nickel, and copper (Falkner et al, 1997), whilst both iron and manganese concentrations increase in the near-bottom layer (Leibovich-Granina, 1985). Atmospheric fluxes of elements entering the lake are low (on average about 3 per cent of the total input) although exceptions do exist for some industrial pollutants transported by air, such as zinc, copper, chromium, and in particular, lead (Boyle et al., 1998; Granina et al., 2000). Atmospheric fluxes of these trace elements can reach 25 per cent, and thus pose a significant threat of pollution to the lake. Furthermore, atmospheric fluxes on the lake surface are higher when one takes into account the input of elements with aerosol particles (Khodzer et al., 2000). It should be noted here though, that overall, modern riverine fluxes of major ions and nutrients are higher compared to those estimated 20-40 years ago (Sorokovikova et al., 2000). It is clear therefore, that a new approach to construction of a more accurate chemical budget is still required.